Traditional rectangle and oval palettes provide a great surface for mixing colors, and come in a variety of sizes to meet the needs of any artist, from on–the–go plein–air painters to those looking for a solid palette for in the studio. 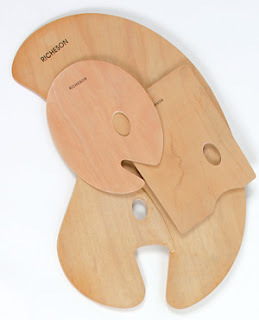 Made of high quality wood for those who don't like to cut corners, also available in a melamine surface. * This spacious old–world palette is designed for comfort and reduced fatigue. Even though it is larger and heavier than other palettes, its shape and balance (due to a counter–weight) help distribute the palette’s weight over the whole arm instead of just at the wrist.